Welcome to the wiki of the Hackuarium association, an open public lab, which wishes to democratise research! BIG NEWS: Hackuarium has moved to a new location! We would like to thank the Foundation Inartis for hosting our activities in Renens for the past four years, and we will keep you informed on this page when we have found a new 'chez nous' where we can install our biohacker space and P1 lab. This page was launched during our 1st Ever Hackuarium Wiki Sprint that took place on 7 December 2014. As you might notice quickly, almost everything here is still a work-in-progress. 3 Where are we located? We actually believe more and more in doing DIT (Do-It-Together) Science, not just 'DIYbio,' as it reflects better the scope of the trans-disciplinary projects we do (often not only biology). Hackuarium is a not-for-profit association aiming to democratise science through public engagement. Our laboratories in Ecublens (Switzerland) is open to anyone sharing the values of the association and who is dedicated to follow the DIYbio Europe ethical guidelines. Our projects are initiated and carried out by scientists and non-scientists from a variety of backgrounds. They are passionate about tinkering with biology in particular, and technology in general. Some are engineers, architects, designers, IT and computer scientists or retired professionals, but others have no scientific education. They are mostly citizens interested in open and participatory research and innovation, outside the constraints of traditional institutions. Hackuarium members want to investigate new ways of carrying out interdisciplinary research and innovation, by making their results open, accessible (low-cost), simple and easily reproducible (low-tech) and by promoting an open source philosophy. And if you are curious where the name comes from, take a look here. To note: this building is really only a provisional space, as it is destined for destruction in the next 3-5 years! We will continue to look for a more permanent space, while developing our community further and promoting Open Science! Hackuarium found its new home (yay!) after being generously hosted for four years in infrastructures provided by UniverCité, an unconventional innovation hub that opened in May 2014 in the "Ateliers" in Renens (formerly IRL building). Our equipment is mostly upcycled material from institutions and industries from western Switzerland. We have documented our working environment as it has evolved. For almost 6 months, our big hoods and other equipment were in storage, ready to be moved into our new lab space, a happy event begun the 1st of February 2019! Between December 2015 and January 2017, UniverCité regrouped our laboratory, a workshop and coworking space. The floor where we originally moved in 2014 required some refurbishing and was under construction work from January until June 2017; and we temporarily relocated on the first floor of the same building. Since July 2017, we have been back on the second floor of what is now called the "Ateliers de Renens" Chemin du Closel 5, 1020 Renens. The original plan in the renovated space was to have a biohackerspace on one side, with a 'pro' lab space on the other, and a shared biosafety level 1 laboratory in between. The community lab idea for UC, however, has now been given over to primarily startup and co-working hosting. When Hackuarium was asked to pay rent as if it were already a startup with a successful business plan, the members decided during an extraordinary general assembly meeting (on 12 September 2018), that we would have to look for a new place to set-up our biohacker space and P1 lab, with enough room to allow further growth and exciting collaborations. A cooperative (Space Alliance Coopérative) with two other associations (Octanis & Polymeka) and a few other startups came together to look for a new place to call home and provide space for everyone's projects and work. Our first activities in the new spaces started in February 2019. Our biolab and inner sanctum for electronics and imagerie and more are already facilitating project experiments, with more fun in the pipeline with our coop colleagues, like Sam and Raffael from Octanis, who were also early members of Hackuarium. Our members reflect the diversity that is in and around the Lausanne area. The Agenda of the next board meeting can be found here. The Agenda of the last meeting, can be found here. Do you have a project in mind? Do you just want to support us? Hackuarium operates on a membership basis, even though all events are open to anyone, including non-members. We would love to have you as a member! Just follow the instructions below. 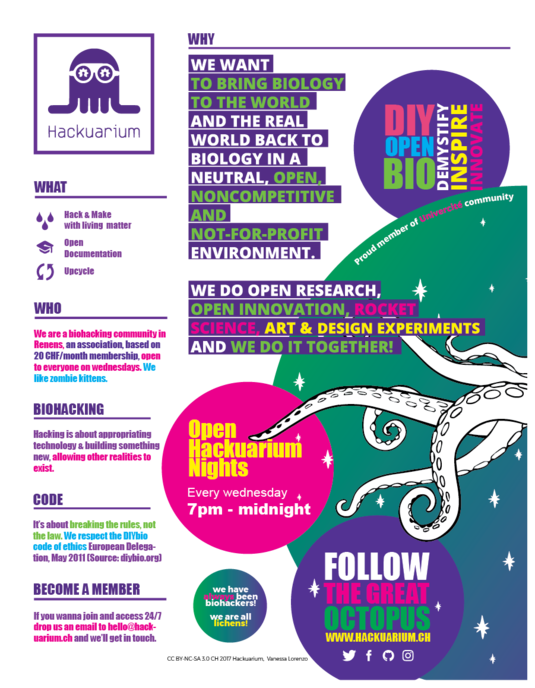 We have a new form on the website, to fast-track joining the community, if you are keen, perhaps after a few #OpenHackuarium experiences (every Wednesday evening is open to the public). Read some helpful info here. Our lab and space are open to the public. Please come and have a chat! And if you have any questions get in touch! You want to organise an event at Hackuarium, or with the Hackuarium community? We have guidelines below. and the 5 year birthday party will be held all day on 5 October! You can find the complete list of our past events here. You want to organise an event? Go for it! Here, you will find the projects going on at Hackuarium. Octanis - All projects from the Octanis association have moved to a new space. For more information about their Rover / Balloon click here. We have very few rules at Hackuarium. The goal of the association is to provide freedom to its members, so they can explore beyond what is allowed elsewhere. However, we want members and anyone participating in our activities to feel comfortable and respected. This page describes the code of conduct for Hackuarium members. You can check online the [consumable in stock]. This on-line document contains all the instruments, tools and consumables we are looking for. We have a standard donation contract (contrat de donation, in French) and if your organisation happen to discard a piece of equipment we are (or may be) looking for, contact us! As a general rule, we do not buy anything. We try to recycle, upcycle, bicycle, epicycle anything we can, or ask around if anyone can provide supplies for free. In some cases it does not work out, and so these are the place where we can find what we need. In any case, Please contact Luc Henry if you need to order anything in the name of Hackuarium. Consumables and some chemicals can be purchased from Huber Lab. More chemicals can be obtained from Carl Roth. If necessary, other chemicals and biochemicals can be obtained from Sigma Aldrich. Molecular biology tools can be purchased from Qiagen. But most laboratory hardware can be obtained from our network of friends and partners. Get in touch with Luc Henry if you need anything specific and we'll do our best to find it. If you want to start or edit a project page on Hackuarium's wiki, please follow these instructions. Delfanti, Alessandro (2014) Is Do-it-Yourself Biology Being Co-opted by Institutions? Grushkin, Daniel	-	Am I a biohazard? Please check our Press kit out. It includes a prototype Press review of most of our media appearances over the years. We now have an identification number aka Participant Identification Code (PIC) from the European Participant Portal for any Horizon 2020 application. The Hackuarium PIC number is 907732306. It can be verified on the official search engine.